Solidarity to the students of Quebec! A statement of solidarity from Iowa's Wild Rose Collective to the student strikes in Quebec. WRC operates in the moderately sized Iowa City, home to the state’s largest university — the University of Iowa. Like many university towns the student population, perhaps the most present in Iowa City, remain relatively silent as political actors. Either unaware of or apathetic to their power to resist the privatization of the University and the laundry list of issues that comes along with that neoliberalization: the perpetually escalating tuition and fees, the bankruptcy of education as a training ground for workers in the capitalist system, and as a little salt in the wound we get to pay for the privilege with an initiation into finance capitalism acquiring a pile of debt to go with our shared not-so-hopeful future. Of course with this slew of problems UI is in company with universities across the country and world, making increasingly obvious the reality that the ‘university in ruins’ is only a symptom of a larger trend of neoliberalization that seeps into every aspect of our contemporary social and political realities. It is from this view that we must recognize the University as a site of struggle. But further, as Iowa City’s largest presence as an occupant, as well as its largest employer, we thus recognize that the University has effects that far exceed its own walls — be it through rent-increases, land grabs and endless construction, precarious labor contracts, or the fostering of a racist, sexist, and homophobic bar culture — these struggles necessarily spill into the broader communities. It is in precisely this sense that we join so many others in voicing our solidarity and admiration to the students, and increasingly workers, of Montreal and Quebec who are committed and relentlessly resisting the attack on the poor and working-class. Similar to the US Midwest, Quebec students face the limiting of access to university in the turn toward neoliberal education policies with continued tuition hikes. These too are the struggles of working people around the world. 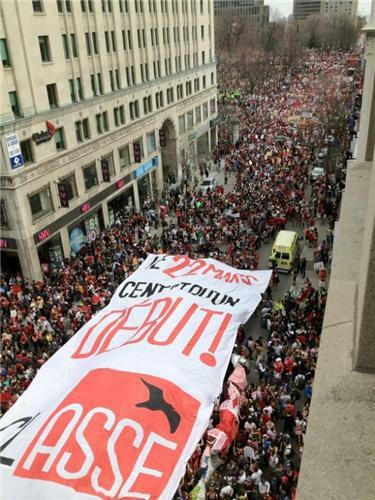 In Quebec many of the most militant involved — the explicitly anti-capitalist, anti-colonialist, and feminist student coalition CLASSE — are not only opposed to the rising cost of education, but instead recognize this trend of austerity in the name of putting a band-aid on the global catastrophes of finance capitalism. While the structure of student unions is largely foreign and in many ways unimaginable to those of us in the US, we still recognize common ground with our comrades in Quebec as they resist the broader trends of neoliberalism. Here we share most affinity with those in struggle and find examples of resistance to bring into our own experiences and analyses of US struggles, especially in a town whose largest political and financial actor is the University.